Before coming to work for The Penny Hoarder, I was a stay-at-home mom for about two years. I initially went back to work following my daughter’s birth (and after taking 12 weeks of unpaid time off via the Family And Medical Leave Act), but I ended up quitting that position, moving up north and spending my days as my child’s 24/7 primary caregiver. And though I’m incredibly grateful for having that time, and I treasure all the memories we made along the way, I’ll be honest: Being a stay-at-home parent is not an easy job. For those who question what a stay-at-home parent does all day, the short answer is: a lot. The real answer would require me writing an entire novella. It’s sort of like being in a secret society. You don’t completely get it until you’re a member. And while I could rest on the fact I wasn’t alone and there was this great camaraderie of stay-at-home moms out there (though I wasn’t the type to join the different mommy groups that exist), the life of a stay-at-home dad is even more obscured from society at-large. Only 4% of American fathers living with their kids in 1989 were stay-at-home dads, according to the Pew Research Center. Fathers made up only 10% of all stay-at-home parents back then. 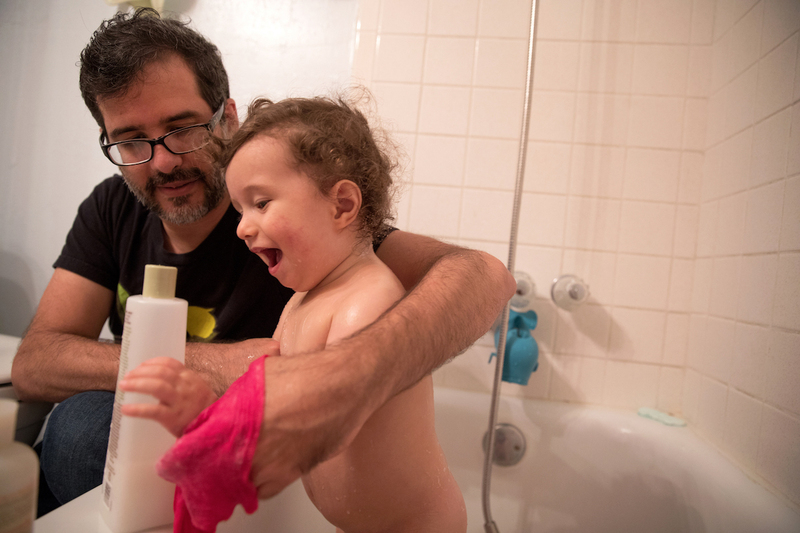 But as more women become breadwinners and the restrictive grasp of traditional gender roles loosens, more and more men are taking on the stay-at-home dad role. About two million — or 7% — of fathers living with their children were stay-at-home dads in 2012, according to the Pew Research Center. Fathers who took on the primary caregiver role increased in representation to 16% of stay-at-home parents as a whole. So in honor of Father’s Day, I’d like to recognize all the dads out there serving as diaper changers, bottle feeders, spit-up wipers, toddler wranglers, play-date arrangers and more — on the clock all day long from sun up to sun down (and multiple times during the night). Here are a few resources to help you make it through. Fatherly is a website geared to helping dads win at parenting. Dads can read articles offering advice and tips for multiple stages of parenting, from conception to dealing with tweens. Recent posts cover topics like using a backpack over a diaper bag and paternity leave. Be sure to check out this fun story on hide-and-seek tips from a Navy SEAL. The National At-Home Dad Network provides community and connections for stay-at-home dads while addressing the challenges they face through their parenting journey. The network hosts an annual At-Home Dads Convention. This year’s will be Sept. 14-16 in Portland. The network has a listing of dads groups across the country or you could start your own. City Dads Group is an organization dedicated to helping all fathers (not just those that stay-at-home) connect with each other. Fathers can join local dads groups for various meetups scheduled throughout the year — or create their own group if one isn’t close. The organization also hosts New Dad Bootcamps in New York City to help new or soon-to-be fathers prepare and adjust to parenthood. Dads can visit the site to read relevant parenting articles or listen to a father-focused podcast. Vicariously join in camaraderie with other dads by following father-focused blogs. DadNCharge, Dads Who Change Diapers, Dad and Buried, Dad Or Alive and Mr. Dad are just a few. And if you want to start your own dad blog and create a community for others who can relate to your journey, check out this ultimate guide to getting started by The Penny Hoarder CEO Kyle Taylor. Nicole Dow is a staff writer at The Penny Hoarder. She thinks stay-at-home parents don’t get enough credit, even though they’re awesome.